No battles, just Victory Brewing night to offer up some samples of their excellent line up of beers at the Greenville Growler Station. Bierfest (Oktoberfest) Hop Devil IPA, Golden Monkee and Dirt Wolf DIPA available for tasting. Andy Bibliowicz, Victory Southern Area Sales Manager, did the pouring and shared his knowledge of the varieties of hops involved. Fun and educational time. Ben Pierson, owner/brewmaster of Swamp Rabbit Brewery and Taproom, wanted an opportunity to recognize the growth and success of the 6 Upstate craft breweries, so he created the first-ever Septembrew Fest at his place in Traveler's Rest. He put out the word, got some food trucks and BBQ caterers involved, hired a band and the rest, as someone once said, is now history. Thomas Creek, Blue Ridge, Quest, RJ Rocker and Brewery 85 joined Swamp Rabbit in offering samples of their brews, some poured for this occasion only, and a good time was guaranteed for all. Park the bikes, get a wrist band! Brimstone Highway's beer-friendly music set the correct tone. Swamp Rabbit's tent stayed busy. Katie and Dana, Blue Ridge with a new Pale Ale that I really enjoyed. Bryant and Travis, l-r, ready to serve. Son of a Peach was still available, as was Bellringer DIPA. Mitchell and Andrew showing pride in their product! Ok, we've got beer, music, fun and games, now we just need some..... Food!! Brat in hand, it was time for me to try that Award-winning Red Whitey, a White ale with attractive aromas of fresh, crushed raspberries. Yum! And refreshing on this hot day. This photo of representatives from 3 of the 6 breweries involved clearly demonstrates the camaraderie and good will that exists here among the Upstate brewers. Cheers to all! Brewery 85, Thomas Creek and Quest smile for my camera. Blue Ridge, RJ Rocker and Swamp Rabbit folks too busy to join in? Cheers and thanks for coming!! This Septembrew Fest is in the history books, time to start planning next year's!! Prepping for the season, had my first Oktoberfest beer yesterday, in a growler from #GreenvilleGrowlerStation, and I and my dinner companions really liked it. I usually don't pay too much attention to this style... that may have to change! Pabst Blue Ribbon - No Longer American? About the enjoy a lot of hops, wet or otherwise, in a Terrapin Beer Co. Hi-5 IPA. Five hops in the bill, hopped multiple times in the boil, dry hopped in the fermenters and probably hopped on the way to the packaging/bright tanks. I'll check the bottom of the can, might be some down there too! Time to collect my notes and photos and describe the fun-filled and educational day I spent at the Carolina BrewHaHa﻿ yesterday. This one, the Second Annual, had more breweries so it took me a bit longer to cover them, mingling with the happy sippers and trying to get the best photo angle. Where else can you work in such pleasant conditions (heat not withstanding) with a beer in your hand?! Well, outside of a brewery anyway. My apologies to any I missed, see ya next year? Music, fun and games and beer. VIP section's Wall of Beer had rare beers including Oskar Blues ten FIDY, Bell's Hopsulation, Andersonvalley's Holy Gose. My first beer taste of the day was this amazing Sierra Nevada Equinox, a single hopped (Equinox) IPA. Only two bombers were available so only early birds paying attention got to try it. I'm not familiar with the Equinox hop so will be doing some research. Apparently a SN proprietary hop. 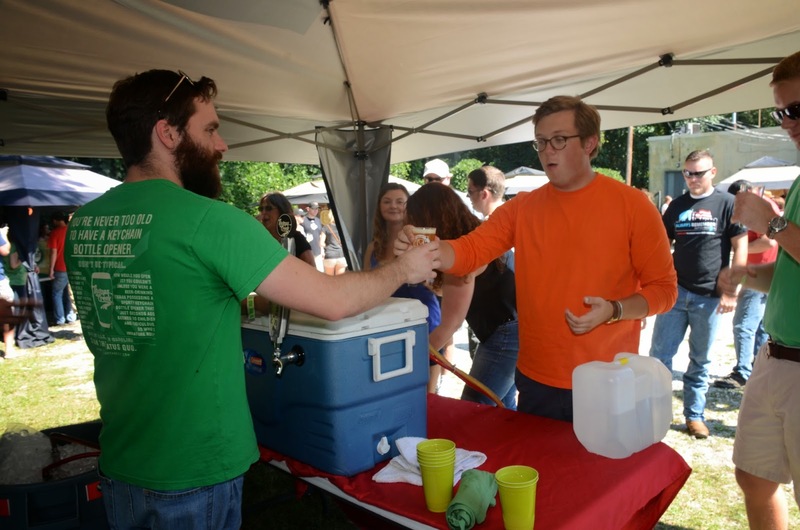 Title Sponsor Thomas Creek had their excellent Trifecta IPA available which Josh McGee was happy to pour. Todd from Anderson Valley Brewing had a not-yet-released brew to try: AVBC Blood Orange Gose. I could easily have drunk it for the rest of the afternoon, but people kept getting in line for it. Did I mention that there was food? Coleslaw had Centennial hops mixed in. Delicious, added to burger. Jake and Stella announcing some winners for special beer prizes, one of which was Pliney the Elder! Even Skjervold from SouthYeast Labs likes other people's beer too! Love the name... and the Irish Red was very malt tasty. Gortex traded his Anderson Valley Gose sorbet for some Stone 18th Anniversary? Padenrich Station got the music off to a great start. Homebrewers from the Anderson area were there to offer unique samples. Clemson Brew Crew brewed away! Even had a sample left from last year. Hi-5 from Terrapin was one of the top three beers for me, for the day. Palmetto Moon Shine had delicate samples of some intensely flavored shine. Bean bag toss with beer requires a deft touch. Here's how it's done. New take on a "beer" mustache. Great looking folks and equally great Espresso Porter. A schedule conflict forced me to leave early (and miss the rain! ), but as I left, the band Peartree Music was entertaining the crowd with some vintage Grateful Dead, always a good choice for beer drinking. Whew! Tired all over again just looking at the pics. Only 364 days and we can do it again.